He was taken to the Royal Gwent Hospital, where she added that he died in her arms. Ryan was diagnosed with a type of bone cancer called Ewing sarcoma in July 2014, just two years after he appeared on the ITV show. Before his collapse, he was being treated at Velindre Hospital cancer centre in Cardiff, where friends organised a concert to raise funds at the hospital just days after he died. Kylie McKee, Velindre hospital's deputy head of fundraising, said: 'I assumed that, given the sudden passing of Ryan, the atmosphere at the event would be very sombre but it was far from it. 'The room was packed full of people in their country and western costumes, dancing and chatting away. Only Boys Aloud's executive director Rachel Dominy expressed her sadness for the talented young singer. 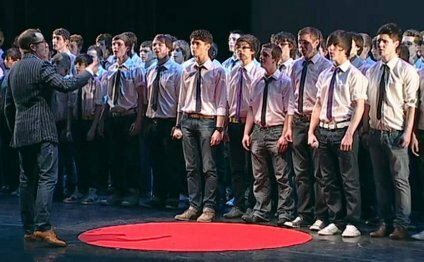 Fellow members of Only Boys Aloud dedicated a live performance to their friend while they gave a performance on Saturday.